I love to eat breakfast out. I don't know why but it seems like such fun to be hoisting our coffee cups with a bunch of other sleepy-eyed early risers. Maybe it's because we only breakfast out when we are going on a trip or we're on vacation or out early for the occasional sunrise appointment. Whatever it is, it always seems like a treat. 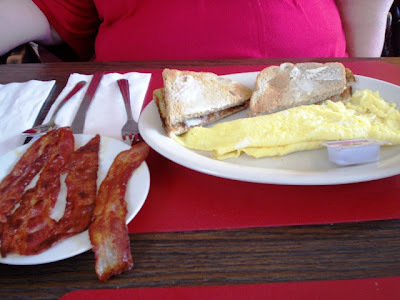 It was two early lab appointments that led Laura and I to be out and about in the a.m. looking for a hearty breakfast. Alex's is right on Route 6 in Seekonk so you can't miss it. 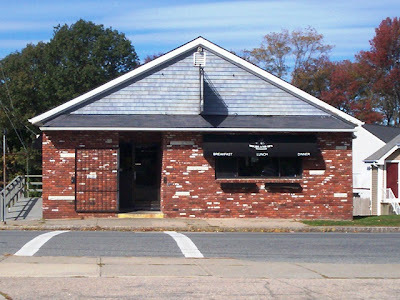 We've driven by here ( too many times to count ) over the years and always vowed to stop in " some day ". Well Friday morning at 11:15 was the day. I had just finished a lab appointment and Laura and I were starved. Now as much as we love the big breakfast giants ( IHOP), we love nothing more than the little mom & pop places, nothing more than the DDD's ( sorry Guy ), you know, the diners, drive-ins and dives. We love places that although neat and clean, look like they've just stepped out of the 50's or 60's. The older decor, banquettes, lighting and signage always make us smile.They usually have their regular customers but welcome all newcomers. 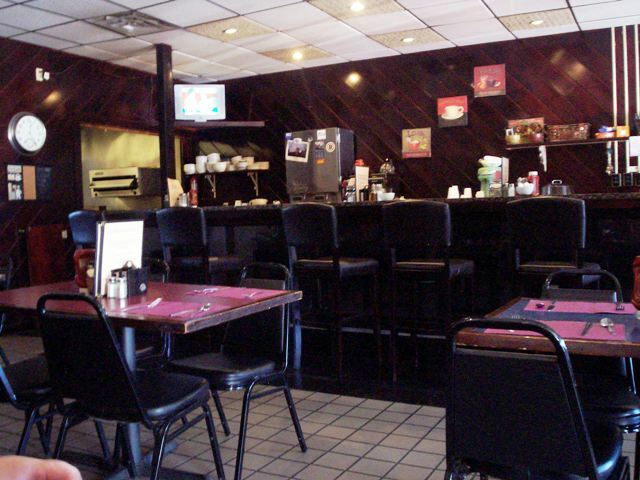 Plus these older established places usually have great food, especially breakfasts. 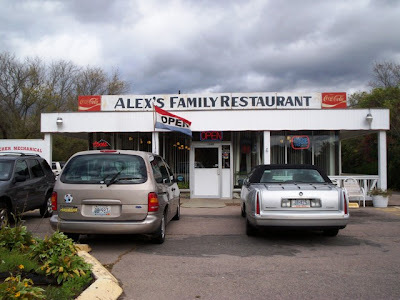 And we weren't disappointed with Alex's. We love the way this place is set up. Bigger than it looks from the outside, it still has that cozy, warm, homey feeling you want in a breakfast spot. It has lots of tables and each one is furnished with the requisite sugar packets and salt & pepper shakers. When we decided where to sit the very nice Mary ( I'm pretty sure this was her name ) came over to offer us coffee and give us a menu. The menu was great and had all your breakfast favorites. Eggs in every manner, omelets, pancakes, home fries and meats including sausage, bacon and chourico ( spicy Portuguese sausage ). It didn't take us long to decide. 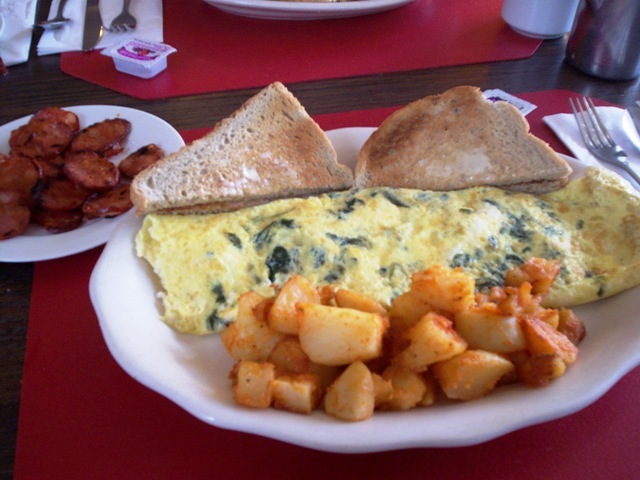 Laura decided on a three-egg omelet with feta cheese and spinach. She also got home fries, rye toast and a side of chourico. 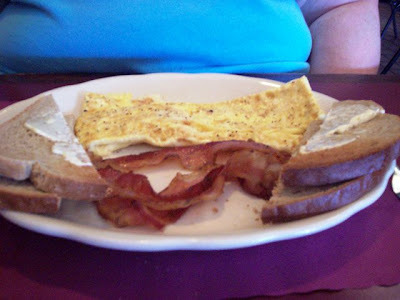 I got an American cheese three-egg omelet with rye toast and a side of bacon. I skipped the potatoes. THE VERDICT: Both meals were terrific and really hit the spot. The omelets arrived hot and were perfectly cooked. My bacon was well-cooked and crisp but not fall-apart crunchy. Laura's chourico came as well-cooked, crisp-rimmed little coins that were absolutely delicious. 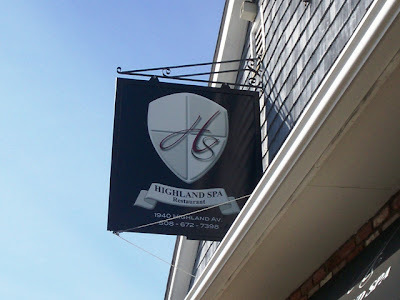 They made me jealous and I vowed to get them the next time we visit. 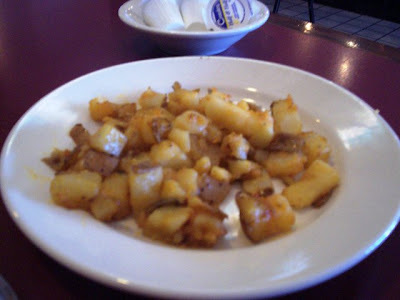 The toast were great and Laura loved her potatoes and found them nicely spiced. All in all, this was a truly satisfying breakfast. 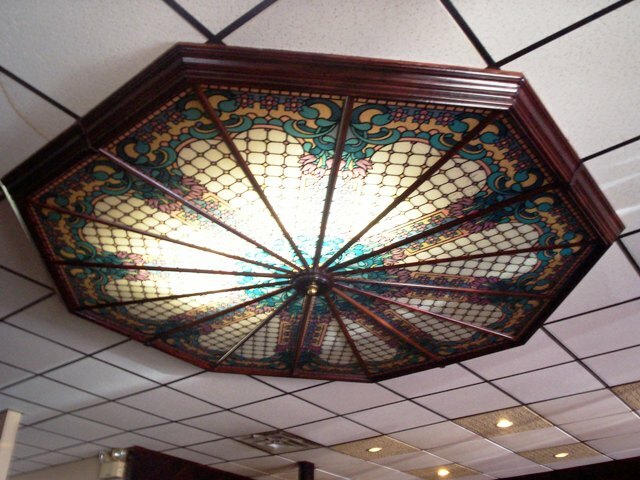 We loved both the food and the decor. If there was one minus, it was that we weren't offered a refill on the coffee ( which was really good ). Could have been an oversight but it won't stop us from going back. Also there was a wait for the bill, but Mary seemed to be working alone, and when she finally came over, she had such a nice conversation with Laura ( about Laura's cute shirt ) that all was forgiven. We love Alex's and can't wait to go back. We left $24 for Mary, which included a 20% tip. As is our habit, we checked out the ladies' room and found it was neat and clean. 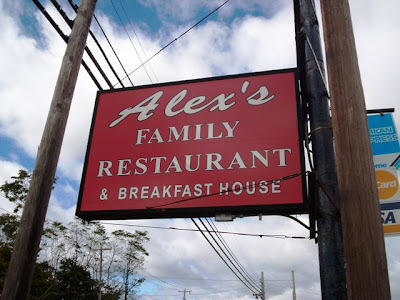 Alex's Family Restaurant & Breakfast House is open from 7 a.m. to 8 p.m. Monday through Thursday, 7 a.m. to 9 p.m. Friday and Saturday, and 7 a.m. to 2 p.m. Sunday. This is another one of those little places that Laura and I have been driving past for years. But today, on a Monday morning ( or early afternoon ) at 12:20 p.m. we finally gave it a try. Now here's where it becomes difficult. I wanted to like this place, I really did. The place was modern, immaculate and adorable. It was much roomier than it appeared from outside and the people that worked there were beyond friendly. So what went wrong ? The cooking ....let me explain. From the outside this place looks like it has about 12 seats inside. But what a surprise when you enter. 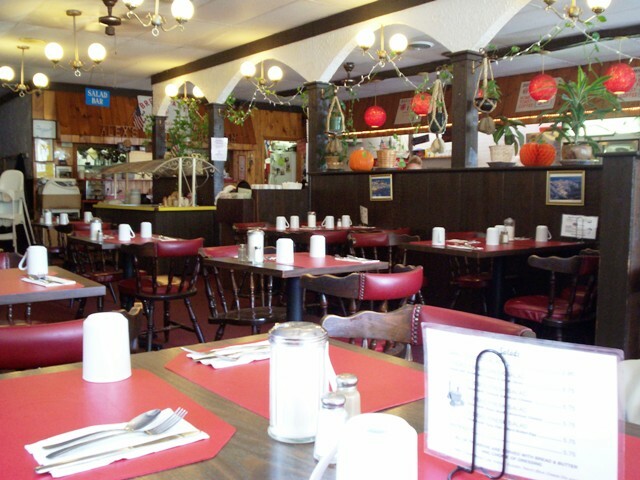 The restaurant goes back much further that you thought and it has several booths on both sides of the room to choose from. What a pretty room it is. Decorated in a nice homey style, it is at once both warm and inviting. We at first took a booth by the sunny window and were engaged in pleasant conversation with a very friendly young man behind the counter. He asked if this was our first time there and if we were from the area and we answered yes to both inquiries.The menus were on the table and the young man brought over our requested coffee (me) and iced coffee (Laura). But after a bit it got too warm by the windows and we moved to another booth across the room. This offered us an even better spot to view this lovely little place. We perused the menu ( which had all the typical breakfast fare ) and quickly decided what we wanted. 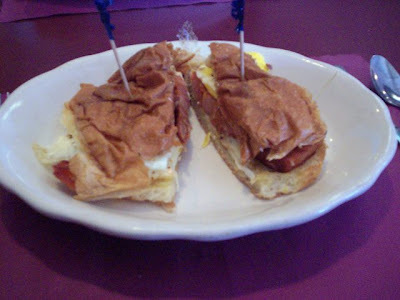 Laura decided to try the Portuguese Sweet Bread breakfast sandwich, which was eggs, cheese and her choice of meat ( chourico ) on a grilled sweet bread bun. I hemmed and hawed and chose my usual favorite, an American cheese omelet with rye toast, a side of bacon and no home fries. A nice girl ( Lauren ) came to take our order. Laura loved the taste of her sandwich. The grilled roll gave a nice sweetness that complimented the egg and rich melty cheese. The only problem was the chourico. It still had it's casing on and thus ( especially since it was cut into logs rather than sliced ) kept sliding out of the sandwich. It made it very difficult to eat. Also it could have used some more cooking time as Laura had a big piece of fat she left on her plate. However while she was eating, the nice young man from before asked her if she'd like some free hash browns with her sandwich. She said sure and we thought that was very nice. Mine, unfortunately, was a disappointment all around. It was a very simple meal but it did not impress at all. It was all about the cooking. I mean ...how can you mess up toast ? ....but they did. First problem, all the food arrived warm but not hot, as I prefer. I don't care for luke-warm eggs. The omelet was posted as a 4-egg omelet but they must have been very small eggs because I've had 2-egg omelets that were bigger. The omelet tasted fine, however, and was well cooked. The bacon was undercooked and had a ridge of fat on each one. They also weren't dabbed when they came out of the pan and left quite the grease puddle on my plate. But the toast, ah, the toast. Poor things were barely toasted and quite cold. Because they weren't hot when buttered, the butter sat in a schmere upon each one and didn't melt into the bread. So each piece of toast had a big wet butter spot and the rest was dry ...and untoasted. I've never had toast this bad. Laura, looking over at my plate, thought I had just gotten rye bread. Almost. It was very disappointing. One nice thing was Lauren did come by to ask it I wanted refills of my coffee. THE VERDICT: Everything about this place was nice except the cooking. I think with a little more basic cooking knowledge and skill, this place would be great. Now you may ask yourselves, " Why didn't you send the food back while you were there ?" Well, it is our habit to base our first impressions on our first meal ....as is. Then when we pay a second visit, if things have improved, we'll gladly do an update to say how great it was. This is such a nice little place that I wish them well and am anxious to return to some improved basic cooking skills and a great meal. Gook luck. We left $20.40 for Lauren, which included a 20% tip. Highland Spa Restaurant is open from 6 a.m. to 2 p.m. Monday through Friday, and 6 a.m. to 1 p.m. Saturday and Sunday.